2nd Floor- Great Room with flat screen TV Sitting area and Ping Pong table, Half Bathroom, King bedroom with en suite tub-shower bathroom, Bedroom with 2 Twins, Laundry, Queen bedroom, Queen bedroom, Shared bathroom with stall shower. DOGS PERMITTED? Sorry - dogs are not permitted at this property - we offer it as a "pet free" property for those with allergies. The perfect multi-generational family home with a ground level en suite bedroom and lots of yard area to play on - Candy's Cove Cottage is a great gathering spot for a vacation. In a great location next to sandy Drift Inn Beach - this property is all about size, location, and setting. Beautiful Drift Inn Beach is just a few hundred feet away along the shore. Many ocean views can be enjoyed from this peaceful five-bedroom, 3 full bath and 2 half bath location on 3 acres with a HUGE flat yard. Watch the sun rise within close sight of islands and fisherman hauling their gear. Play on the large yard behind the house. Swim and treasure hunt along the shore in front of the house or at neighboring Drift Inn Beach or kayak from the shore, perfect for some of the rental boats offered from nearby Port Clyde Kayaks. Port Clyde Village is only about a mile away and is a quick drive for morning coffee, lunch, or evening ice cream after dinner. SECURITY DEPOSIT: Yes, a $500 Refundable Security Deposit is required for Guests that don't have a previous/proven relationship with our company. The security deposit is due 30 Days prior to arrival and refunded within 30 days of departure. I like working with On the Water in Maine! They are concerned about guest experience, and were very responsive during booking and during the time we were at the house. Based on the photos on the website, we had high expectations of this house--and it went beyond those expectations! In a wonderful oceanside setting, the house is spacious, clean, and comfortable. We loved having so many bedrooms and bathrooms. Because we had more than usual rain, we didn't spend as much time outside as we anticipated, but we settled into the living room that has great water views. The only thing that prospective renters should be aware of is that the area is limited in dining and activity options. This is a great property if you want to spend time at the house, beach, and in a hammock or playing lawn games. But if you're looking for many options to be out and about in the surrounding area, you'll be spending time driving. This is the most efficient & friendly agency I have dealt with. Every person that I spoke with was friendly & knowledgeable. Kudos to the entire staff, a pleasure to do business with!! This is a beautifully appointed & generously supplied "cottage" The pantry, with its attention to detail, made it easy to enjoy meals both inside & out The fire pit was a treat that we made use of every day. The vistas were appreciated thru most every window. The beach front, even though rocky, gave us fabulous finds of beach glass. On the Water in Maine is a high-end vacation service we've enjoyed using for many years and we will keep coming back. We love the open downstairs of the house and how you can see the bay from every window on the back side of the house. There are many spacious bedrooms and bathrooms and it's luxurious living there! As always On the Water provides excellent service. Again a wonderful stay. This is the perfect house for our family. The view is outstanding and even though our week was mostly fogged in, we had plenty of space to play board games and do puzzles. The staff at OTW were all top notch. They were all very knowledgeable and wanted their customers to have the best possible experience. They were always very quick to respond to my emails or calls and very polite. Candy's Cove Cottage was phenomenal. The views were breathtaking, the layout of the house was perfect, the property was quiet and secluded. It felt like we were on our own island. Almost organized web site and company. Everything goes very smoothly to make vacation more enjoyable. Another wonderful vacation in a great spot. Comfortable accommodations . Renting the property was extremely easy! Loved the atmosphere! Back yard is beautiful. Best rental agency we've worked with hands-down. Superior customer service and excellent property choices. Great cleaning staff. Very organized/well-run. We loved the location-right on the water and we were able to kayak directly from the backyard. The house was in excellent condition and high quality. We loved it! Very easy to reserve and to check in and out! This is our 4th year to book through on the water! The views at Candys Cove are beautiful! The house accommodated our friends very well! The kitchen is well equipped. From the beginning of our rental to the end, everything was communicated to us in a very pleasant and friendly manner. This was our first time to Maine and the first time using On the Water in Maine for a rental. We saw the pictures that were posted for Candys Cove, but until you actually see the house and the neighborhood you're not really sure what you're actually getting. WOW is what we all said. The house is beautifully! We love the extremely large bay windows in the family room/living room. The view is great. Plenty of room for activities and sleeping. We really enjoyed our rental! Working with On the Water couldn't be easier. The company is one of the most well organized I have ever worked with, and they represent great properties. Candy's cove is a wonderful property. Spectacular view, well appointed home, and a great location. We can't wait to return. As always, everything went easily and smoothly. There might be a better agency somewhere, but we doubt it. We have never come across a team that is as well organized, efficient and friendly. It is a great pleasure to have worked with you for five seasons, and we would not dream of trying anyone else. Candy's Cove is a comfortable, welcoming place with outstanding views. All our friends felt comfortable and happy, and we did, too. Everyone with On the Water Maine is very friendly and helpful, knowledgeable of the properties and easy to get a hold of if needed. The ocean views from this property are amazing. The property is perfect for a large family or two families. Very easy! We communicated almost entirely by computer. We love the upgraded bathroom in the master. We have rented here twice. This time was even better than the last! The fire pit was wonderful! We were very relaxed by the water! Justin at On the Water in Maine was very helpful. Beautiful home and incredible view. Very informative, easy to reach and helpful. The experience was great. Beautiful site, well appointed home in a great area. OTWIM is great. We have used them for our vacation rental for two years in a row and don't have plans to seek properties through anyone else. Candy cove cottage was beautiful. The views from this property are phenomenal! Loved going to sleep at night listening to the waves! Can't wait to go back! I had no problems with the agency, and no reason to call them in during our stay. The house and grounds were lovely, even more beautiful in person that the website revealed. Working with everyone at On the Water in Maine was wonderful! All of our communications, (email and telephone) were great. Meg was very helpful and Justin was too. The house was as advertised! It was located in a beautiful area with a lot of privacy. Overall, you have a marvelous oceanfront rental with high-end appointments and forever views! 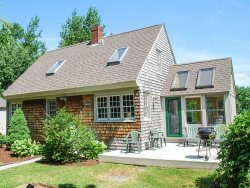 Jaw-dropping views of ocean, evergreens and cove from every window...high-end kitchen appliances and accessories....comfy beds with lovely linens...well-maintained lawns. Please know that we loved our month in Candy's Cove Cottage and would like to return in 2 years for another month!